Description: Annual. Purple Ruffles is a beautiful form of basil that grows about 1/2 feet high and has ruffled jagged leaves. The scent and flavor are slightly different from sweet basil with more licorice and cinnamon flavor. It has beautiful lavender pink flowers which are edible also. Very ornamental. 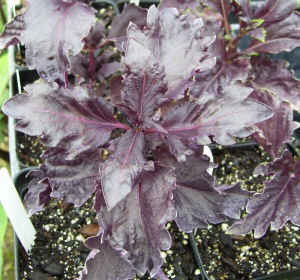 Purple foliage provides excellent contrast with silver/gray plants.